Kerala is truly the undiscovered India. It is God's own country and an enchantingly beautiful, emerald-green sliver of land. It is a tropical paradise far from the tourist trial at the southwestern peninsular tip, sandwiched between the tall mountains and the deep sea. Kerala is a long stretch of enchanting greenery. The tall exotic coconut palm dominates the landscape. Archaeologists believe that the first citizens of Kerala were the hunter-gatherers, the ting Negrito people. These people still inhabit the mountains of southern India today, consequently, they had a good knowledge of herbal medicine and were skilled in interpreting natural phenomena. The next race of people in Kerala were believed to be the Austriches. The Austric people of Kerala are of the same stock as the present-day Australian Aborigines. They were the people who laid the foundation of Indian civilizations and introduced the cultivation of rice and vegetables, which are still part of Kerala scene. They also introduced snake-worship in Kerala. Traces of such worship and ancient rites have been found among the Aboriginal tribes of Australia. Austric features can still be seen fairly and clearly among the people of Kerala today. Then came the Dravidians (The Mediterranean people). Dravidian absorbed many of the beliefs of the Negrito and Austric people, but they were strongly inclined to the worship of the Mother Goddess in all her myriad forms: Protector, Avenger, Bestower of wealth, wisdom and arts. It has an area of 15,005 sq. miles. [38,863 sq. km. ] about one percent of the total land area of India. The state stretches for about 360 miles along the Malabar coast on the western side of the Indian peninsula; its width varies from 20 to 75 miles. It is bordered by the states of karnataka on the north, Tamil Nadu to the east and the arabian sea to the west (map). Kerala is situated at the Southwest tip of India main land on the Arabian Sea. Kerala is bound by Arabian Sea on the west, Karnataka on the north and northeast, and Tamil Nadu on the east. The state can be divided into hills and valleys, midland plains and coastal belts. The hills of Kerala dot the Western Ghat from Ponmudi in the south to Munnar in the centre and Sultan's Bathery in the north. In the coastal belts of this state are situated world famous backwaters that are more or less main attraction of Kerala. Kerala, the land surrounded by the pristine waters of the Arabian Sea, has an equable climate that varies from season to season. The presence of the Western Ghats on the eastern side of the state and across the path of the southwest monsoon creates an important climatic zone with copious rainfall on the windward side and a dry belt on the lee side in the east. The Climate of Kerala can be clasified roughly into three categories. The summer in Kerala lasts from March to May and is followed by the southwest monsoon spell lasting until the middle of October. The northeast monsoons take over the relay around this time and linger on till the month of February. Even at the height of the monsoons, the temperature rarely dips below a pleasant 18 degrees c. It has a warm and pleasant tropical monsoon climate with seasonally excessive rainfall. The climate is pleasant from September to February, which is also the peak tourist season. The summer months are warm and humid with a mean max temperature of about 33 degree c.
Kerala is blessed with plentiful rain, 54% to 85% of which is contributed by the monsoons. Monsoons bring to Kerala two rainy seasons-the southwest monsoon or the Edavappathi, bringing rains during June-September, and the north east monsoon or the Thulavarsham during October to December. Kerala is directly exposed to the southwest monsoon but also receives rain from the reverse (northeast) monsoon. Rainfall averages about 118 inches (3,000 millimetres) annually statewide, with some slopes receiving more than 200 inches. The north east monsoon season begins from the middle of October and lasts upto the end of February, though the rain associated with it ceases by December. The total annual rainfall in the state varies from 380 cms over the extreme northern parts to about 180 cms to the south. The amount of rainfall decreases towards the south almost in proportion with the decrease in altitude of the Western Ghats. July receives the maximum rainfall with all meterological centres recording about 25 rainy days. Neriyamangalam in Ernakulam district records the highest amount of rainfall 104 cms. Malayalam is the official language of Kerala. It belongs to the Dravidian languages category. The language is rich in literature as many literary. The language has close resemblance to Tamil, another language of Dravidian origin. Tamil greatly influenced the early development of Malayalam. English stands only second to Sanskrit in its influence in Malayalam. Hundreds of individual lexical items and may idiomatic expressions in modern Malayalam are of English origin. Malayalam literature takes a lazy and winding route till the end of the 18th century, after which the modern period begins. The Ramacharitam (1300AD) is the oldest Malayalam text. Writings of the first few centuries were in Mani-pravalam or the �high style�. This went on until Cherusseri Namboodiri turned his attention to pure Malayalam and wrote Krishna Gatha in early 15th century. This was again followed by a generation of campu compositions, a mixture of prose and verse with a liberal sprinkling of Sanskrit words. The themes were from the great Sanskrit epics and Puranas. As late as the 17th century, the first big Malayali poet, Tunchattu Ramanuja Ezhuttachchan adopted the Sanskrit alphabet in place of Malayalam�s incomplete one. A new literary type arose in the 18th century, the Tullal or dance drama, which again dipped into the Ramayana, Mahabharata and Puranas for themes. Kotungallur (in North Kerala) and Trivandrum (in South Kerala) became the two hectic centers of literary activity in the second half of the 19th century. Volumes of translations were being written � Valiya Koyil Tampuran�s Shakuntala (1881), Kunnikkuttan Tampuran�s Hamlet and Mahabharata, Vallattol Narayana Menon�s Ramayana (1878) and others. It was a period of original works too, with a flood of essays on historical and literary topics, dramas, novels and poems, and literary journals. The first and original novel in Malayalam was T. M. Appu Netunnati�s Kundalata (1887), but more popular was Chantu Menon�s Indulekha (1889). Some of the later novelists were Vennayil Kunniraman Nayanar, Appan Tampuran, V. K. Kunnan Menon, Ambati Narayana Potuval and C. P. Achyuta Menon who grounded the present day Malayalam prose style. Vaikkom Mohammad Bashir is one of the most loved literary figures of Kerala. Some poets of the modern school are Kumaran Ashan, G. Sankara Kurup, K. K. Raja, Channampuzha Krishna Pilla and N. Balamaniyamma. As the state with the highest literacy rate, Kerala is one of the intellectual centers of the country. It is just the place for literature and litterateurs today. Geographical Kerala is located in the southwestern tip of the Indian peninsula and extends between the latitude 10�00 North and longitude 76�25 East. Kerala is bound by the Arabian Sea on the west, Karnataka on the North and Northeast, and Tamil Nadu on the east. The Malabar Coast of India is the site of Kerala location. Geographical Kerala is a part of the coastal belt with the hill ranges known as the Western Ghats running along the length of Kerala. Rain bearing clouds of the South west monsoon bring heavy rainfall to geographical Kerala during the months May to September. Tropical rainfall occurs often during the year. Geographical Kerala is a tropical region, with weather being pleasant for most of the year. Humidity increases during the monsoon season. Kerala location gives it its unique climatic and geographic features. Kerala has a coastal belt with sandy beaches and palm lined shores. 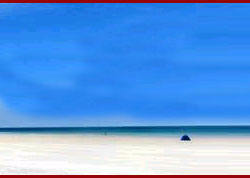 The seaside Kerala location, makes it a pleasant holiday destination, with sunny beaches and serene backwaters. The hill ranges of Kerala have hill stations, wildlife sanctuaries, tea estates and spice plantations. Geographical Kerala exhibits diversity in climate within the compact Kerala location on the Malabar Coast of India. The state of Kerala is a narrow strip located along Arabian Sea in the southernmost tip of Indian Peninsula. The state has been crisscrossed by a number of water bodies (popularly known as backwaters). This has given birth to internal water navigation systems, which also work as the major trade ways in the state. These backwaters of late have become the major tourist attractions of Kerala and people have started offering luxurious houseboat accommodations to the visitors. Reaching to Kerala is not a difficult thing. Thiruvananthapuram, the state capital, is connected to most of the major airports in India, including Delhi, Mumbai, Chennai, and Bangalore. As the Thiruvananthapuram is an international airport, there are considerable connections to gulf countries also from this airport. Kochi and Calicut are other two airports connected from air to other cities in India. Rails are another good way of moving inside and from the outside Kerala. There are around 200 railway stations in Kerala connecting most of the places in the state to places in the other parts of the country and inside the state. Long-distance express trains connect important places in Kerala to places outside the state like Mumbai, New Delhi, Chennai, and Kolkata. Roads in Kerala are in much better shape than other states in India. Major modes of road transport are buses, tourist taxis, cars, and local taxis and autos. State is connected with other parts of South India by a number of National Highways. Tamil Nadu, Karnataka, and Andhra Pradesh are some of the neighboring states that are easily connected to Kerala through roads. From Cochin (Kochi), there are regular ships venturing towards the Lakshadweep Islands. Inside, backwaters of Kerala act not only as a popular transportation medium but are tourist attractions in themselves. These internal water navigation systems are today the single most popular travel product of Kerala.